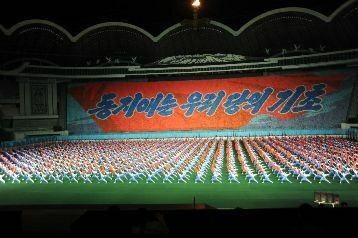 Please see below some pictures of the North Korean Mass Games. These are held in the biggest stadium in the world. 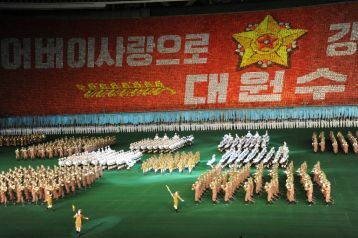 There are up to 100,000 people participating in the show. 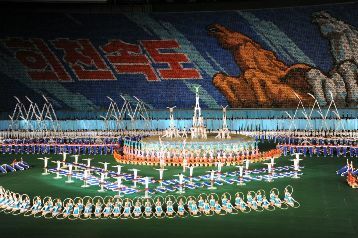 As you can see from the images, a high level of coordination is required both on the pitch and in the backdrop. 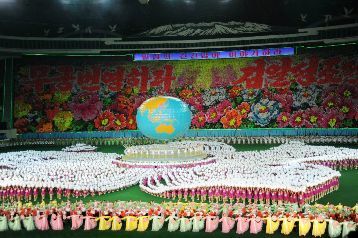 While people dance, play instruments and carry out acrobatic shows on the pitch, the backdrop is constantly changing with each individual forming a pixel in the largest pictures on Earth. 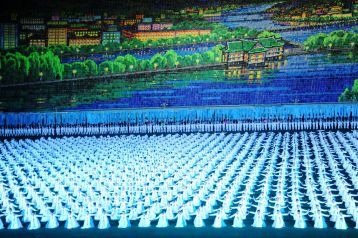 See below how the acrobats form towers and between them and the backdrop there are different levels of acrobats spinning. All this is set up within seconds by the participants. 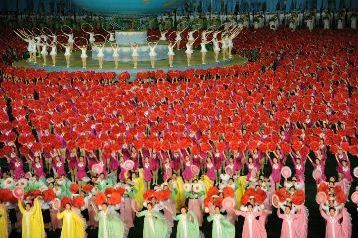 Please click on our North Korea Tourism page go from our North Korean Mass Games section to our tours page.